Nearly 4,800 researchers from 70 countries descended upon the historic city of Boston to share, learn and discuss all aspects of Alzheimer's research. From the tiniest molecules to public health to care and support, sessions are happening around us that are real time changing the world as we know it. Since my tenure with the Alzheimer's Association,we have seen the field of Alzheimer's research grow and change. It was only a few short years ago we couldn't actually see the disease in a live person's brain. Now, commercialization of brain imaging technology will radically change and expand our capacity to examine the enigma that is Alzheimer's. It is exciting to think about what we will see at next year's conference. However, my optimism is cautioned with the knowledge that Alzheimer's research depends on us, the funding is only perpetuated by our never-ending call for more and better funding. The news coming out of AAIC is entirely too long to list here. Be sure to visit alz.org/AAIC to find the latest news, or follow the hash tag #AAIC on twitter. 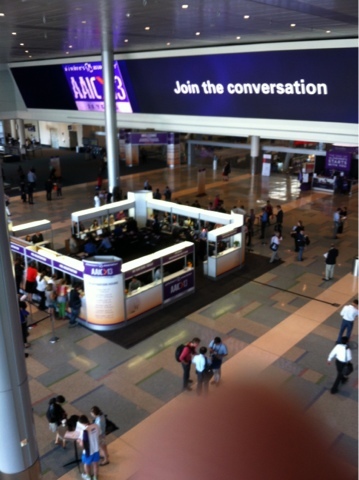 Boston was the perfect place to host AAIC this year. It is such a pivotal year in all of the forces that effect Alzheimer's research, from the advances in science to the politics. similar to our cause, Boston balances history with innovation. 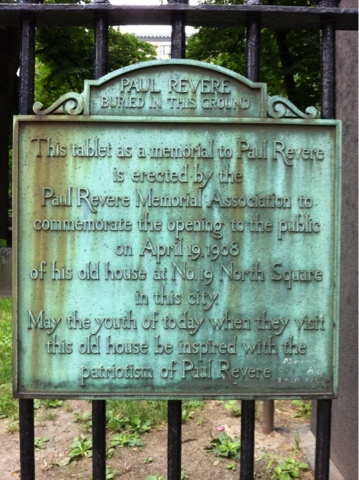 Boston is also the nurturing home that birthed our independent spirit and the fight for our freedom. And this week, Boston is once again hosting a fight for freedom, freedom from Alzheimer's disease. But not this week. On my run around the city on Saturday morning, I rounded a corner and arrived at the top of the famous Beacon Hill, and nearly fell down. There at the top of the hill, swaying from the Massachusetts state house was a giant, purple Welcome AAIC banner! Throughout the city, streetlight banners welcomed our group. And on my walk home from dinner on Saturday night I could see the purple glow of the video board in front of the Boston Convention Center, brightly urging passers by to join Walk. At times this weekend I have been so filled with purple pride, I've had to wipe away tears. But they are tears of joy and excitement! Dr. Maria Carillo, vice president of Medical & Scientific Affairs for the Alzheimer's Association, said it best, "The Alzheimer's Association is the international steward of Alzheimer's research." The responsibility for advancing the research of Alzheimer's and related dementias is up to us. You and me. 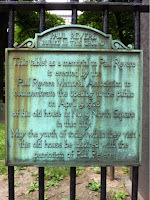 My long jaunt across Boston on Saturday morning brought me also to Paul Revere's home. There is a remarkable bronze statue depicting the "Midnight Ride." This kind of historical, larger than life monument makes you truly examine your mark on this planet. And it dawned on me. WE are the Paul Revere of our time. Marching through our streets with our purple banners waving, sounding the alarm, "Alzheimer's is coming! Alzheimer's is coming!" We are the rallying cry, calling on our friends and neighbors to suite up and join the cause. There are some whose weapons against this disease are electron microscopes, analyzing genetic sequences, and conducting clinical trials. But our weapon is just as important. Our VOICE. If not us, then who? We have to sound the alarm. Freedom fighters, I am calling on your strength and heart. Join the fight for our independence from the great oppressor that is Alzheimer's. Advocate. Walk. Donate. Educate. We have a place for you in our army. In conjunction with the AAIC, we released in partnership with the CDC The Healthy Brain Initiative: The Public Health Road Map for State and National Parterships, 2013-2018. Read more here. Monday night we hosted our first Walk to End Alzheimer's kick-off for this year in Beckley! A great time had by all, and we look forward to our next Walk Kick-Off in Charleston on July 25. Find more info here! Our next Caregiver University will be held in Martinsburg on July 31! REGISTER HERE! Next Monday, I have been invited to speak at the Select committee on PEIA, Seniors & Long Term Care the WV legislature. If you had the opportunity to share with them your experience with Alzheimer's, what would you say? Email me your thoughts at lkirksey@alz.org. Additional Angel's Perch showings have been booked for Morgantown & Bridgeport! Check out more info by visiting angelsperch.com. The past few days in Boston have been jam packed with Association business and science, so I haven't had much time to go site seeing. But, hey a girl's gotta eat, right? Eating is one of my selfish luxuries. When I know I am going to be traveling, I save my pennies so I can splurge on really wonderful eats. At this point, I am no longer eating out of sustenance, but pure gluttony. Boston has amazingly rich food, sea food, Italian food, Irish food, fancy celebrity chef food. I have died and gone to food heaven. I knew this food onslaught was coming, so when I planned to have dinner with my mom & sister the night before I left - I demanded home cooking. It is not lost on me how fortunate I am to have my mom and dad live down the street. Meals with my family are my all time favorite, no matter what we are cooking. And Thursday night was no exception. We had all been running a million different directions. Both my parents and my sister were out west for the past few weeks, so my family-time tank was on empty. My mom and I were feeling relatively apathetic about dinner. I was in the midst of a giant laundry and packing project, so my brain was mush. "What do you want for dinner?" "I don't know, what do you want for dinner?" This could really go on all night. We started plotting out our dinner, and the final product turned out to be just as delicious as if we had planned it for weeks. I am not sure at what point we decided to throw it all in one pot, but it was yum-o! Pre-heat the oven to 450. In a skillet, or on a baking sheet, drizzle a few tbs. of oil. Place the chicken in the pan. Surround the chicken with whatever vegetable you happen to have handy. We had mushrooms, potatoes, and a sweet Vidalia onion. Grab whatever fresh herbs you happen to have laying around. 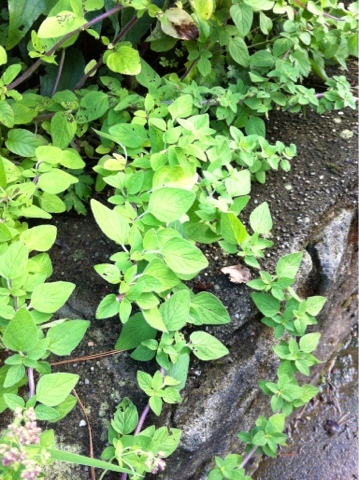 My mom has a giant oregano plant, that you can smell from a few feet away. 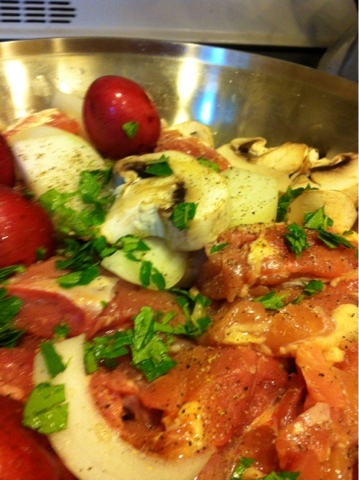 Roughly tear up the herbs and add on top of the chicken and veggies. Pour a little more oil on top, add salt and pepper to taste. Bake for 30 minutes, or until the chicken is done, and viola! We mixed some fresh cherry tomatoes with pepper and basil, and cut up a watermelon. It was delish! We ate it all!! 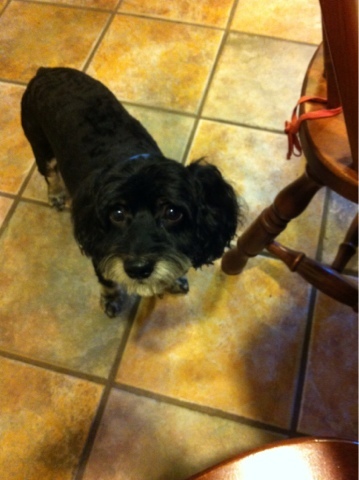 Sorry Ollie, none for you this time. Keep up the good fight. Until next week!